So, you want to calculate orbits? Well, do you? If so, I hope this can show you how to calculate and therefore simulate an orbit yourself! By this I mean you will be able to calculate a satellite's altitude and velocity at a chosen time, among other things, like OrbitMFD shows. Let's assume we're orbiting Earth, and that there are no other forces acting on the satellite other than the Earth's gravity. So, what do we do with this assumption? 1. Decide on an apogee and perigee. Let's have a nice sensible 400 x 1400 km orbit. 2. Calculate some constants for the orbit. 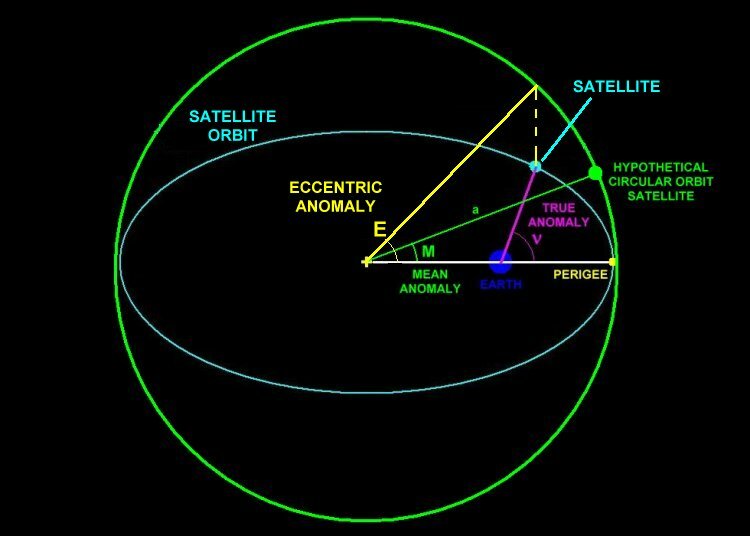 These constants are a)Apogee and perigee radii b) Semi-major axis, c) Eccentricity, d) Mean motion and e) Orbital period. 3. Decide on a time for which you want to calculate the altitude and velocity. By 'a time', I mean 'how far into the orbit do you want to be?' - eg: if t=0, you are at perigee. If t=T/2, you are halfway round the orbit and at apogee. If you choose anything in between, you will calculate for that position. So this basically means 'how many seconds past the perigee do you want to be?' - you can't have a negative number, or a number larger than the orbital period. t = T/2 = 3089.5 seconds. 4. Calculate some anomalies (angles). These angles are in radians! As you can see, all three anomalies are equal at this point, meaning that our method is working (since we are calculating for the apogee where they all ~ 3.15 radians. The actual value is 3.141 radians, but the reason we are slightly out is because of rounding in our previous answers. No biggie at all). 5. Calculate the final result! A little note: This number should be zero at apogee, but again, it's because of rounding. This is not a big deal, and will still give us a perfectly accurate answer. Finally, we can now calculate our results! As you can see, there are minor errors of ~ 2km in altitude, and hence a tiny error in velocity, but this is all because of rounding in the constants and prior results. If you use a program to solve these equations, you will get far more accurate values. It is of course inconvenient to solve these equations manually, but if used as part of a program which continues to solve as time increases, a very accurate orbit simulation can be made! All times are GMT. The time now is 10:34 PM.